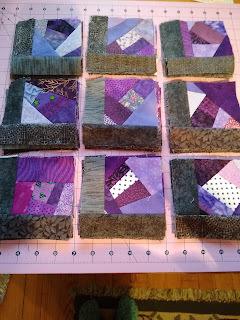 I completed my #onemonthlygoal for March 2019 which was to complete, with sashing, 72 scrappy purple blocks for another wheelchair lap quilt. 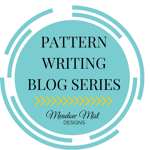 This project was inspired by the Bread Crumbs Quilt at TheQuiltPolice. It may turn out to be that quilt, or it may end up a bit different. Will have to see how I feel about it when I lay it out. 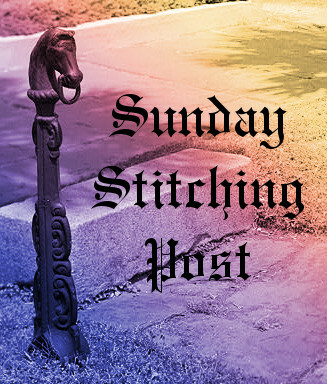 Linking up with Oh Scrap! 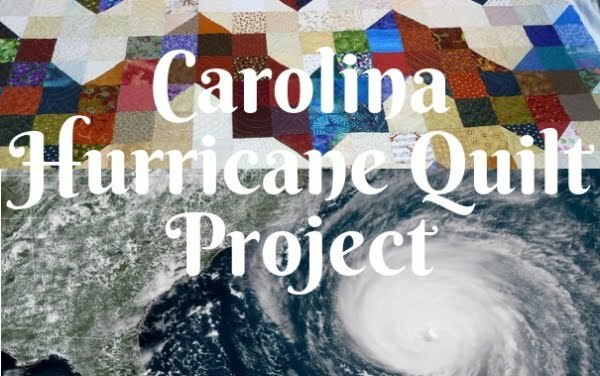 this week as well as the One Monthly Goal project at Elm Street Quilts. I first heard about this book on Following the Thread. 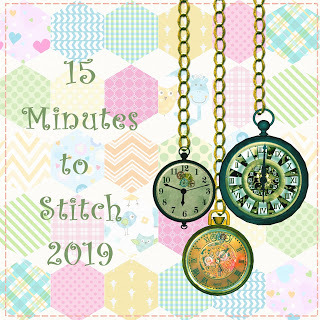 I have stitched for at least 15 minutes per day on 11 out of 16 days so far this month (68%) so I am on track with my 15-minutes-to-stitch goal. As of yesterday I am at 54/75 days for the year which is 72%. Since the goal I set was to stitch 50% of the days I am doing well. I finished the T shirt quilt and the binding on the log cabin wheel-chair quilt. Since it is super-scrappy I am linking up today with Oh Scrap. 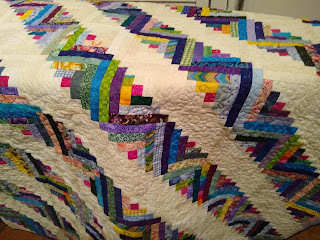 I have been working on quilting a bargello wall hanging that I want to donate to the NHPBS spring auction this month. Not a lot of progress so far on my OMG, but there is still time this month. A bit ahead of the eve of March Madness 2019, which is the deadline I set for completing my husband's T-shirt quilt, I have finished the quilt. The quilting was supposed to be done by last Wednesday, but it wasn't. I started quilting with a variegated thread and I didn't like how it looked so after part of a block was quilted I stopped and tore it out. 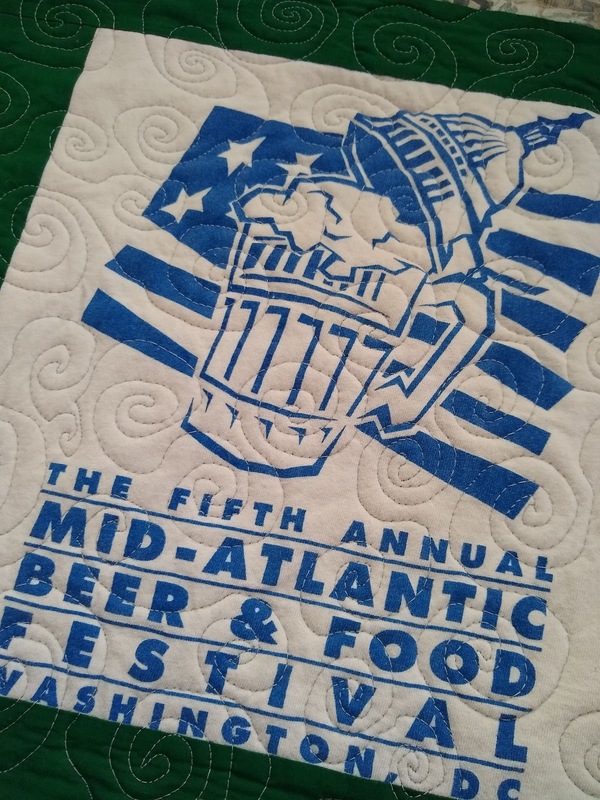 I switched to a grey thread which looked much better on the different T shirts and finished quilting and binding the whole thing this past weekend. I have several things I would like to get done this month including finishing the T-shirt quilt and making some grain-bag totes. 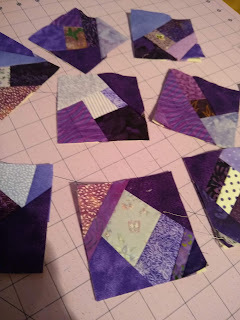 However, I decided that my #onemonthlygoal will be my purple scrap quilt. I started making blocks last month with purple scraps on muslin foundations and figured out that I will need 72 to make a wheelchair lap quilt. My specific goal for March is to complete all 72 blocks including the sashing on 2 sides of each block. If I get the top assembled that will be a bonus. I just bought some beautiful variegated purple thread which will be great for quilting this when I get it put together. 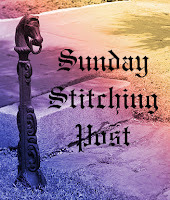 Linking up with Oh Scrap! this week as well as the One Monthly Goal project at Elm Street Quilts. I stitched for at least 15 minutes per day on 73% of the days in January and February. (43/59 days) so am doing well with my15-minutes-to-stitch goal. I completed the top for the streak of lightning quilt and found backing fabric for it so it can go to MK for quilting hopefully this week. I started quilting the T shirt quilt but decided after 1 block that I didn't like how the variegated thread looked so that got pulled out and I need to start quilting again with different thread. I finished quilting the log cabin wheel-chair quilt and have more hand-sewing to do on the binding. I finished quilting and binding my NY Beauty wall hanging and just need to add a sleeve for it. The Wisc. Beauty I made it for was very pleased with it.